In order to facilitate access to the information you need, please consider these steps in the search functionality. 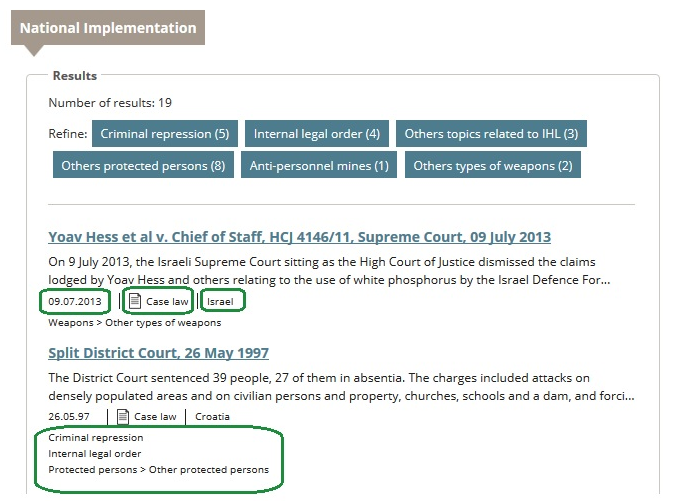 in the Customary IHL database, you search term can appear in a footnote, and it might therefore not be readily visible in the linked document. In order to locate the exact passage, it might prove easier to click on the print icon and use the "find" function of your web browser. Common to all three databases, search criteria can be entered in the free-text entry area, and specified if all words are to be found (logical “AND”), any word (logical “OR”), or the exact match (for example searching for exact “respect for family rights” would not retrieve documents with the phrase “respect for their family rights”). Select the database(s) that interest you. More information on each resource is available on the respective database’s home page. Treaties database includes treaties, State’s ratification with possible notifications, and the Commentaries to the Geneva conventions of 1949 and to their Additional Protocols. This is the only database to offer texts in both English and French: select from the drop-down menu. Enter your search term(s) in the text form. Click on the < Search > button. To erase all previously selected options, click on < Reset search form > . All words will retrieve documents that contain all the words you have entered, in any order. It corresponds to the Boolean AND. E.g., entering < forced labour > will retrieve documents containing sentences such as " …. the Forced Labour Convention …. " and also such as "… the prohibition of forced or compulsory labour …" and " … Convention on the Forced Disappearance of Persons … . …slave labour are also prohibited…"
Any word will retrieve documents that contain at least one of the words indicated. It corresponds to the Boolean OR. E.g., < cease-fire ceasefire > will retrieve the term with and without the hyphen, while < labor labour > will match both spellings. Exact Phrase will retrieve documents that contain an exact match of the terms entered. E.g., entering < forced labour > will retrieve pages that contain the search terms in that exact order (i.e., the earlier example result "of forced or compulsory labour" will not be retrieved). Select if the search is to be carried out in Rules or in Practice. See this database home page for a description of these two aspects. 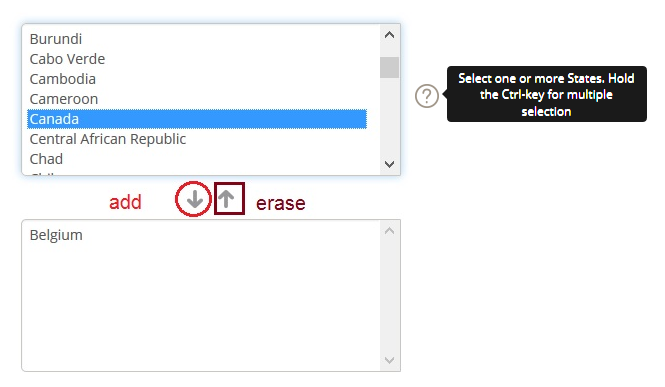 to select a State: click on the State’s name, then on the “down arrow”; conversely, to erase a State from the search box, select it and click on the “up arrow”. Treaties & Introduction: this is the main page for any given Treaty, briefly highlighting the focus of the treaty, indicating the date of adoption and date of entry into force, and so on. Commentaries: Commentaries to the four 1949 Geneva Conventions and their Additional Protocols. States: indicating participation to a treaty (signature, ratification, possible notifications or reservations). Please note: Date restrictions can only be applied to States, Commentaries and Introductions. Applying this filter to Articles will retrieve zero results. Title will retrieve documents where the search term(s) appear in the title, e.g., in a Rule title, or in a Chapter title, etc. E.g., < target selection > will only retrieve pages relative to Rule 21, where the search terms are in the title of the document. The same search phrase as exact match across all Rules retrieves 8 results. State please see the section above on this topic. Type of practice allows you to select which practice should include your search terms. Check the required checkbox(es). A short description is available in the Sources section of the database. Hint: Combine a search in Title with Country or Type of Practice when presented with a large number of results . For example, searching < child > will retrieve too many results to be all listed. However, you can access these results in a two-step process where you select , different types of practice, one at a time. Searching the database on national implementation of IHL can be restricted by States, or by topics. 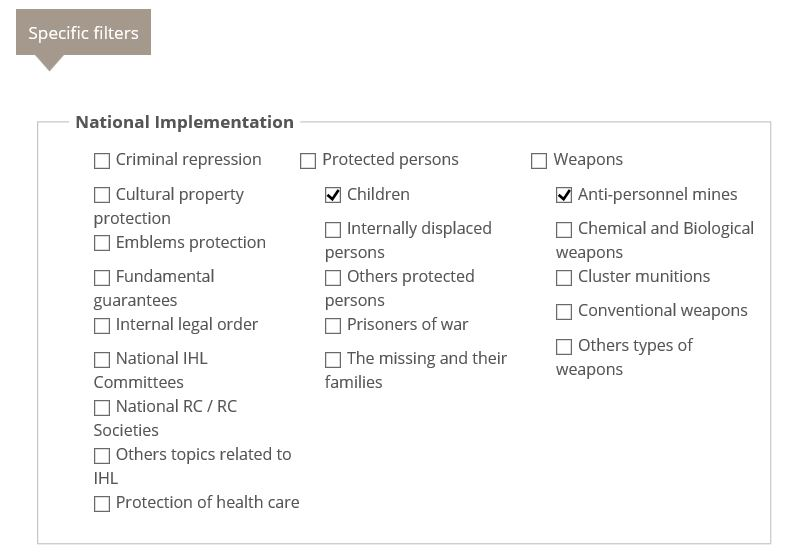 Please note that topics “protected persons” includes all of “children, internally displaced persons, other protected persons, prisoners of war, missing and their families”, and that “Weapons” all of “anti-personnel mines, chemical and biological weapons, cluster munitions, conventional weapons, other types of weapons”. The results page groups the results from the selected database or all three, according to the choices made in the search page. Please note that only the first 300 results can be listed. If your search terms retrieve a larger number of results, you should refine your search criteria. If you cannot choose different search options (e.g., “exact phrase”), consider selecting a State or a number of States. Use the database’s filters (a type of document, or a specific topic) if it is impossible to choose a more precise search term. Results can be refined according to the type of document for the Treaties and the National implementation databases. In the example below, clicking on “Commentaries” or “ Ratifications” will list only these types for the Treaties database, whereas the National Implementation database indicates that the search term is present in the topics listed. The < Search details > are shown as a reminder, and the user can go back to the search screen by clicking the button < Modify search >. 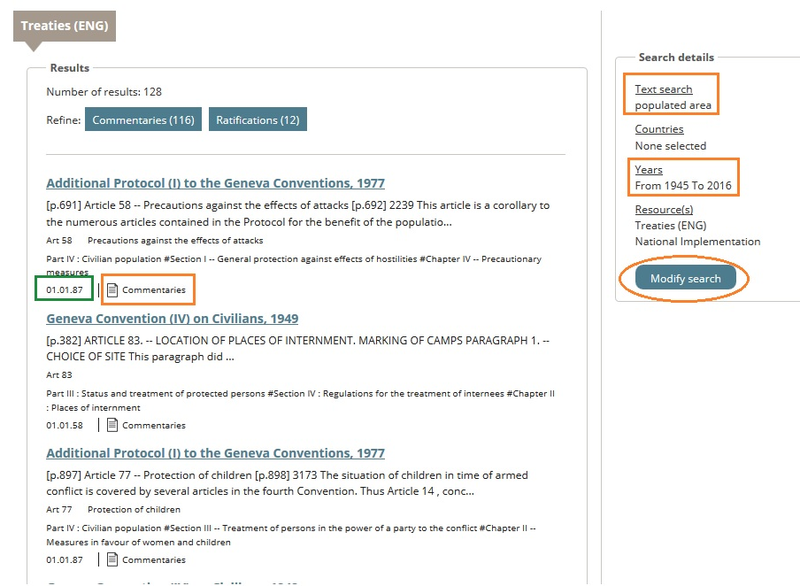 Results for the Treaties database are grouped according to their type (in the example below, only Commentaries and Ratifications matched the search term); to see only one type of results, click on the appropriate button. The National implementation database shows the different topics that match the search term, and it allows the user to select one of them. The date of either case law or legislation is shown, as well as the State.